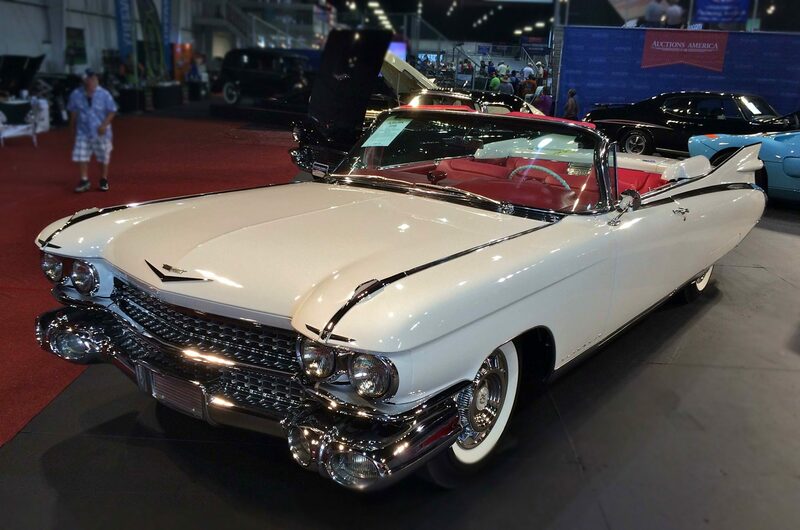 Fully equipped and opulent in it’s design, the 1959 Eldorado Biarritz is considered by many to be the most recognizable post-war Cadillac ever built. It represents the height of the tailfin period, and is certainly a car that proclaims “I’ve arrived” wherever it is driven. This sleek new body style for 1959 became an icon, and at $7,401 sticker, just 1,320 copies of the Bairritz left Detroit in 1959. This example is presented in the classic Olympic White paint with red leather interior, and includes the full complement of power accessories such as steering, brakes, seats, locks, mirrors, trunk release, and even a power operated top. The engine is a 390 ci V-8 pushing 345 HP, and is correctly finished in Cadillac blue with the gold air cleaner. The brushed aluminum trim and stylish dashboard are all part of the package that made Cadillac the “Standard of the World” in 1959.